On July 10 there was an action in Krakow in solidarity with our comrade V. who was fired from EasyJet in Spain. Several people from different unions were fired at the Malaga airport, including our comrade from the CNT Valencia. EasyJet is a very profitable airline but saves on workers' salaries and benefits. The firm has been faced with strikes in several countries, including Spain where workers went on strike following the union busting repression. Leaflets were handed out in the train to the airport in Krakow and a protest was held in the main square of the city. ZSP drew attention to the situation of EasyJet workers and in general to working conditions in different airlines. 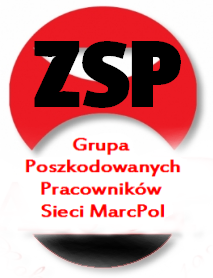 MarcPol is the first supermarket chain in post-PRL Poland, operating since 1988, mainly in Warsaw and nearby towns. For the past few years, it has been behind on rent and sometimes payments to workers. ln April, the owner sold the majority stake to another company but 10 creditors took the company to court where in June, bankruptcy was declared. (In Poland, creditors can also declare the company bankrupt and try to recover money from liquidated assets.) But a second entity was also set up in April - Marcpol Bis. The firm was set up with a minimum of share capital.Although the first firm is "bankrupt", some supermarkets still operate under the title "Marcpol". Some of the old Marcpol supermarkets are also run by the firm Doroty Plus. The Chairman of that firm was, up until a few months ago, a member of the board of Marcpol. In order to see how this web is tangled by a group of investors, we can point out that in April another firm, Marywilska lnvest, was set up, and its partner is BT (Bruno Tassi). Doroty Plus, which runs some of the supermarkets, is owned by the same person as Bruno Tassi. Marcpol Bis already has been reformed as Delikatesy Stolicy. The former owner of Marcpol opened a new corporation less than 2 weeks ago. So while assets and employees are being switched around behind closed doors, many workers have been left high and dry by Marcpol. Another group of workers are still working and should have had their contracts transferred to the new owners but were offered new contracts on less favourable conditions. A few months ago, a conflict started against the firm „Mumciuch”, part of the JMP group. Mumciuch is an internet shop which sells maternity and children's clothes and uses pregnant women and children as models. Unfortunately, they did not pay some of them for their work. Several people contacted the union to take action. Mumciuch is part of the JMP group, which is headquartered in a small town south of Krakow. JMP has two main lines of business: maternity clothes (with an internet shop and its own brand of clothes) and training seminars, including help in obtaining European Union funds. It also runs a foundation. The owner of the group has promoted herself as an example of female entrepeneurship. The Mumciuch shop page also had some nice words about the „social responsibility” of the firm! Unfortunately, they were not so responsible for the pregnant women who worked for them. The situation concerned more than a dozen people. Unfortunately, some of those involved decided to take the long way – by going to court. We say the long way because one of the models took direct action and already received her money a while ago. We wish good luck to the others. In the meanwhile, we hope that nobody else will be deceived by this company. The ZSP Multi-Branch Union in Warsaw is drawing attention to a shady practice which we uncovered being used in the Praski Hospital. The situation started when workers were afraid they would lose their jobs on permanent contracts to an external company. This hospital, like many others, did any with some workers directly employed in favor of external companies. In the case of Praski Hospital, some workers had fixed-term contracts which the hospital allowed to lapse, without offering any extension. It came out that the hospital also was using some shady practices. Contracts were signed for less than the minimum wage but then they claimed that extra payments made for working the night shift meant that the worker actually earned the minimum wage. This practice is currently upheld by the law, meaning that a minimum wage worker in fact can be denied in practice extra payments for overtime or night work. Various proposals have been recently made to eliminate this practice. What is interesting is that in the Tri-Partite Commission, even the employers agreed to eliminate this practice. This is because they found it is sometimes hard to get people to work the night shifts without it. Despite agreement between the main unions and the bosses, the government did not accept proposals which would end this practice. 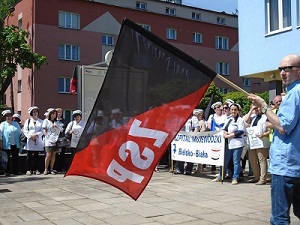 The situation of workers in the SPZOZ Hospital in Bielsko-Biała has been difficult for years. Over the past year, the hospital has gone on strike and given new demands to the hospital. The Ministry of Health was involved with mediation in June 2016.. 13 of the 21 demands of the workers were fulfilled, but still not the demands for a wage increase which is crucial. Since the mediation did not fulfill all the demands of the workers, a protocal was signed, a so-called "protocol of differences", after which a strike can follow. The workers consider that the hospital is in a financial condition which would allow them to give raises. They also point out that some other health care workers received raises after negotiations with the Minister of Health - for example, many categories of nurses. However, it seems like the hospital is concentrating on plans to modernize and improve the infrastructure but has not planned any raises. The workers are planning a warning strike this month. Workers who were renovating social flats in the Wola district without any contract and were not paid have won a payment order from a Warsaw Court. It looks that after months of going without their pay, the workers will finally get their money. The Wola district, as well as public institutions like the Ministry of Defense, have been hiring shady sole-trader companies to do renovation work. ZSP has been fighting so that workers in such situations have either work contracts or the salary equivalents of normal contracted work, along with benefits. The government has passed laws with would make this possible - but not obligatory. Public institutions in Warsaw thus continue to give work to shady companies through public tenders. In the fall of last year, the workers joined to take action in their case after they were cheated and wound up in a homeless shelter, with no money to live. They occupied the Wola district office where they were told that "nothing could be done" about their situation. Representatives of the Office did not want to pay them, but also did not pay the company who it had contracted. They denied that they had any possibly to check the legality of the workers of the companies they contracted, which is not true. They just do not care. Anarchosyndicalism is currently at a crossroads. On the one hand, we have new opportunities to build active movements on the ground which can show another model for workers in struggle. On the other hand, insufficient mobilization and coordinating efforts on the global level and slow progress have lead some activists towards “quick fix” solutions of unsustainable service models or non-libertarian but perhaps more syndically oriented models. The anarchosyndicalist lnternational cannot rest in light of such developments and must retake the initiative to be a reference for anarchosyndicalism and a model for new anarchosyndicalist activity around the world. In order to do this, we must break a certain Eurocentric mentality and encourage organizational models which can work in parts of the world that have a lack of anarchosyndicalist tradition. For this project to work, we have to maximize our efforts and to strengthen the existing IWA Sections. Anarchosyndicalism cannot be treated as a great theory that maybe can happen years from now but must be seen as a practice that can be used now by working people to spread our method and as a tool of struggle. We need to learn from the lessons of our movement and not return to the bankrupt strategies. The X Congress of ZSP took place in Krakow on May 2-3, 2016. The Congress focused on matters of our union activity and development, as well as some international issues. It was followed by an open meeting to present our activities and tactics. A new section from Opole was admitted at the Congress. Reports were given about groups of workers we are currently cooperating with and/or speaking to and which ones potentially could join our organization. Another part of the Congress dealt with updates on current conflicts comrades are involved in. Almost all of the affiliate organizations of ZSP are currently carrying out conflicts in a number of workplaces and all of the delegates were actively involved in at least a couple of them. The Congress showed that the organization is most active on the level of workplace conflicts and that there are lots of groups of workers interested in concrete cooperation. Workers are organizing at Zle Mięso vegan restaurant in Wroclaw to take action and fight for their rights. This restaurant, which markets itself as alternative offers no real alternative for workers. Some work under the table with no work record, social insurance or benefits; others who got a contract were given two different contracts - one for the worker, a different one for the owner, in order to cheat on social security payments. According to workers, when they asked for explanations, they were threatened. Workers also claim this pseudo-leftist boss warned about his "connections" (ie, dad who is a politician). After this, some workers quit but intend to fight for what they are owed and demand better working conditions in this restaurant. We won't eat where working conditions stink and comrades have informed the vegan and activist community of what is happening in this restaurant.